During spaceflight, astronauts lose bone mineral density, but it is not clear exactly what causes this loss. Scientists trying to understand why recently went fishing for answers. They reared small freshwater fish aboard the International Space Station for 56 days and examined the animals' jawbones and teeth for any potential effects from microgravity. 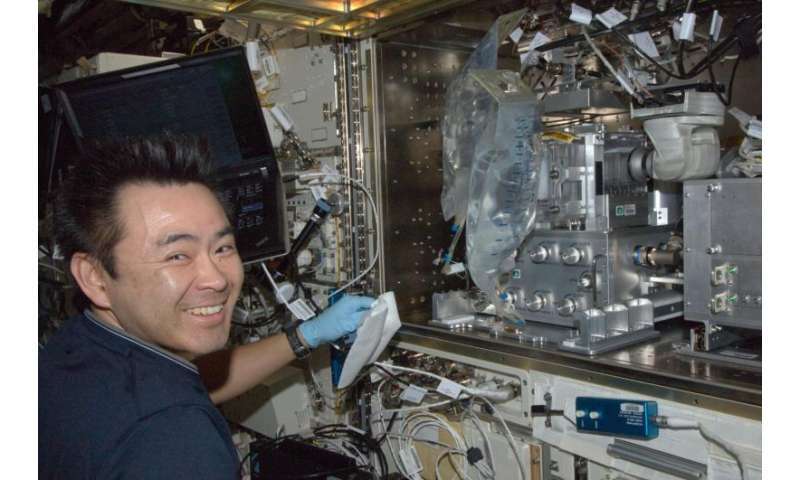 Previous studies suggest that microgravity activates osteoclasts, cells that control the breakdown of bone tissue, and the Medaka fish investigation examined the relationship between this increased osteoclast activity and reduced bone mineral density. A paper based on the Medaka results was recently published Scientific Reports. 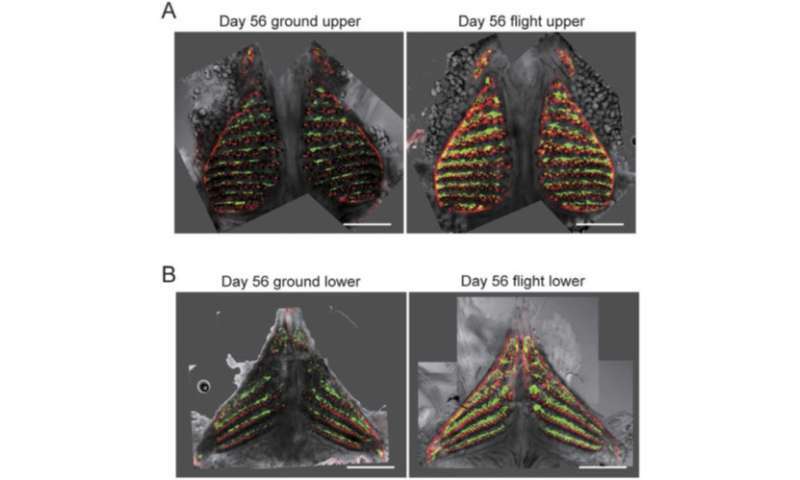 Co-author and principal investigator Akira Kudo, a professor in the Graduate School of Bioscience and Biotechnology at Tokyo Institute of Technology, said investigators found increased volume and activity of osteoclasts and significant reduction of bone mineral density in the fish aboard the station. Using electron microscopes, investigators also observed abnormalities in osteoclast mitochondria. Mitochondria are round or rod-shaped organelles inside most of our cells that produce enzymes for converting food to energy. Genetic analysis also revealed significant increase in activity in two genes that may be involved in mitochondria function, suggesting that osteoclast activation might be linked to the reaction of mitochondria to microgravity. "If this is also true for astronauts, medicines that target mitochondria dysfunction may restore the bone loss in space," said Kudo. Additional research will be necessary back on Earth to verify this information in order to take these findings to the next step. Medaka fish are considered model organisms for life science research, which means they have characteristics that allow them easily to be maintained, reproduced and studied. Previously, these fish were mated successfully in space and the resulting eggs developed and hatched normally. In this investigation, 24 fish were transported to the space station and spent two months in the Aquatic Habitat in the Kibo module. The fish used for this experiment have fluorescent osteoclast cells, which makes them easier to observe. "It has been difficult to understand the mechanism of age-related bone loss on Earth," Kudo said. "The Medaka experiment finding of new genes affected by microgravity provides a good animal model to clarify this mechanism." The work could advance development of drugs to treat osteoporosis here on Earth in addition to reducing bone loss in astronauts on long-term missions. Other results from the experiment conducted on Medaka and recently published in a PLOS ONE paper identified 11 genes involved in changes in other tissues, including the brain and intestines. Several of these genes overlapped with those involved in bone loss, making it likely they play a role in sensing microgravity. Researchers plan to test the function of these genes in future space station experiments. For this Medaka investigation, though, fishing for answers yielded an excellent catch.